Pound Cake: Preheat oven to 350° F. Line an 18 x 13-inch baking pan with non-stick aluminum foil or parchment paper. Make cake mix according to package instructions. Stir in the almond extract. Pour into an even layer in the baking pan. Bake for 18-24 minutes, until a toothpick inserted in the center of the cake comes out clean. Loosen the cake from the edge of the pan and allow cake to cool completely. 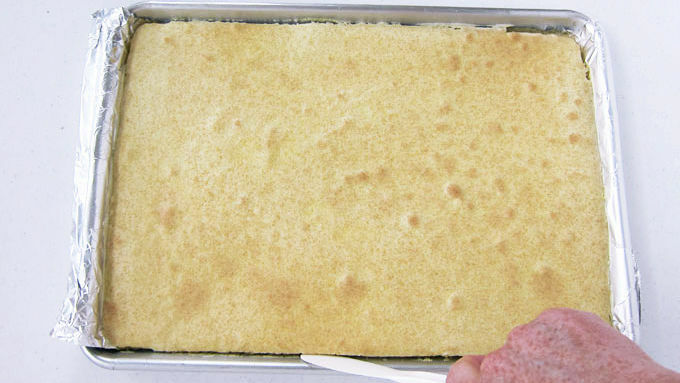 Remove cake from pan and peel off aluminum foil or parchment paper. 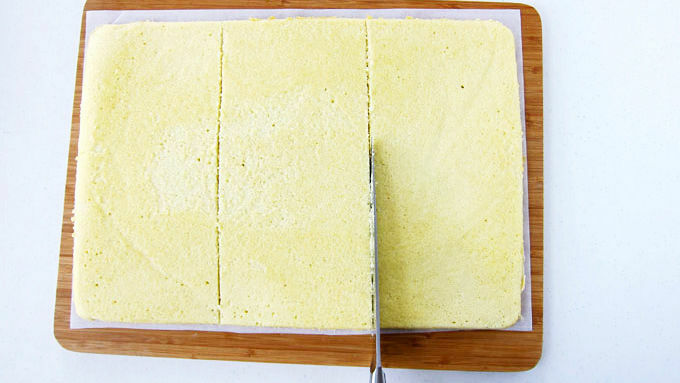 Cut cake into three 13 x 6-inch pieces. 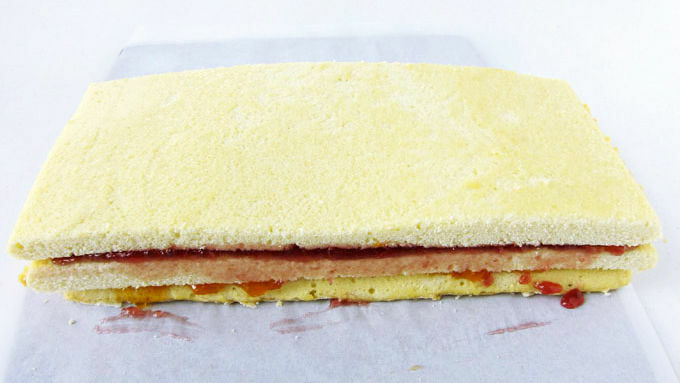 Filling: Spread apricot preserves over one cake slice. Top with another slice, then spread raspberry preserves over that slice and top with the third slice. Freeze cake for 1 hour. 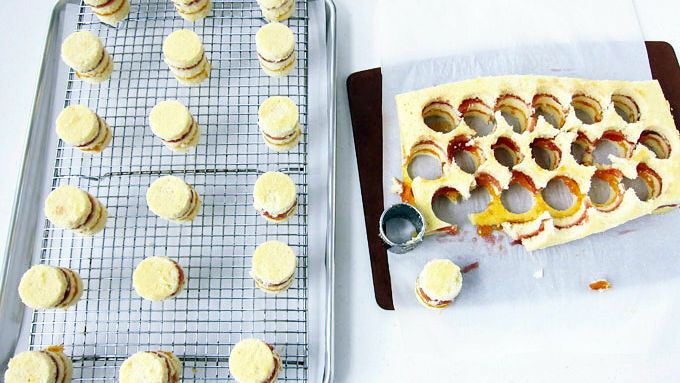 Remove cake from freezer and cut into 20 circles using a round cookie cutter. 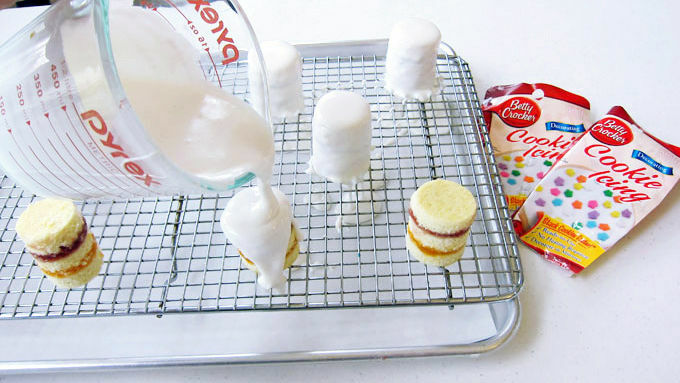 Set mini cakes on a cooling rack that is set over a parchment paper lined baking sheet and allow cakes to thaw for 30 minutes. 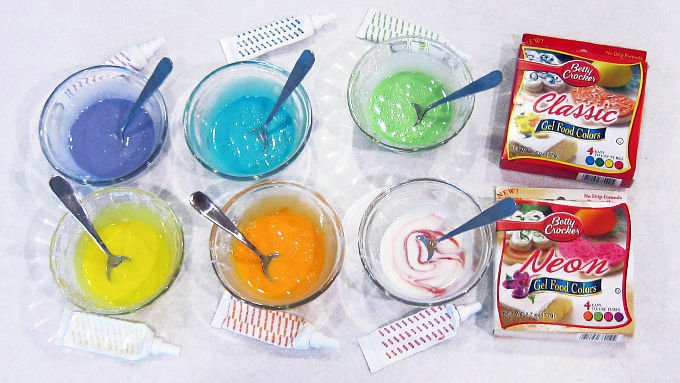 Glaze and Rainbow Ganache: Cut open the tubes of icing and pour into a microwave-safe measuring cup. Heat on high for 30 seconds. Stir. If icing is not yet thin enough to pour over cakes, heat for 10-second increments, stirring after each until thin. Pour icing over as many cakes as you can, covering the cakes completely. Scoop up the icing and reheat as needed. Allow icing-covered cakes to harden for at least 30 minutes. Remove cakes and clean icing off the bottom edge of each cake. Clean the cooling rack and set the cakes back on top. Make ganache by combining the white confectionery coating, whipping cream and corn syrup. Heat in the microwave on high for 15 seconds. Stir, then heat for 10-second intervals, stirring after each, until melted. Divide into 6 small bowls. Color one bowl purple, another blue, green, yellow, orange and red. Drizzle a rainbow of ganache over each cake. Start by pouring a thin stream of purple over the middle of the cake. Next pour on some blue, then green, yellow, orange and red. Allow ganache to dry, then the cakes are ready to serve. Colorful mini cakes perfect for your next birthday, shower, or brunch. Brighten up a batch of petit fours with a rainbow of color. 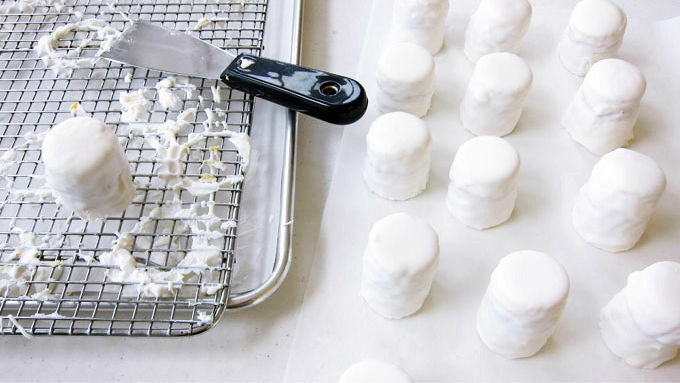 Start by making tiny almond pound cakes filled with layers of apricot and raspberry preserves and coat them in bright white icing. 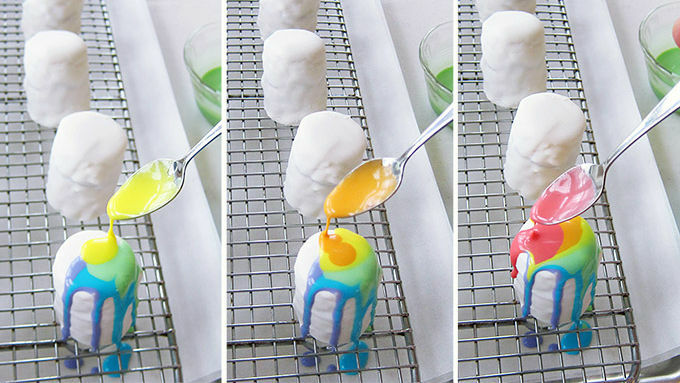 Then let the fun begin by drizzling on colorful white chocolate ganache. The effect looks like crayons melting down the sides of the little cakes. They're cheerful and fun and will look great on the dessert table at a baby shower, a birthday party, or a ladies luncheon! 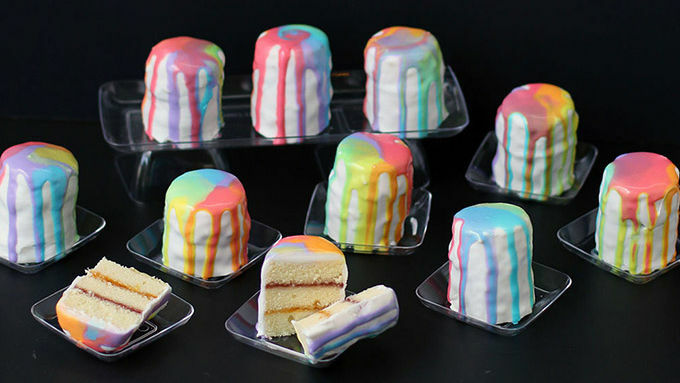 Serve these pretty rainbow petit fours and enjoy the burst of color the mini cakes will bring to your party!